Prof. Gary L. Hylander will present a lecture at the Bridgewater Public Library on Tuesday, June 10th at 7:00 p.m. His topic is: D-Day June 6, 1944. The month of June marks the 70th anniversary of Operation Overlord, the Allied invasion of Europe. The greatest armada the world had ever seen began to assemble in the pre-dawn hours off the French coastline in preparation for the final assault upon Hitler’s Germany. 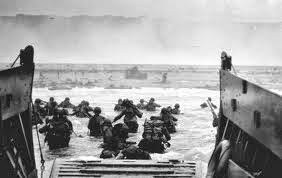 In his General Order for the day Eisenhower called the attack a “great crusade” and assured the soldiers about to storm the Normandy beaches that the “hopes and prayers” of the free world “march with you”. Gary L. Hylander earned his Ph.D. at Boston College. His advisor and dissertation director was the noted Boston historian, Thomas H. O’Connor. Dr. Hylander is currently an independent scholar who specializes as a Presidential Historian, pedagogical specialist for the NEH and an adjunct professor of history and education at Framingham State University and Stonehill College. Gary is a frequent presenter at library forums, historical societies, senior living centers, civic and professional organizations as well as a public affairs commentator on local cable news and radio.